Flocks & Flyways társasjáték - Magyarország társasjáték keresője! A társasjáték érték! A Flocks & Flyways egy remek társasjáték, 2 - 4 játékos részére, az átlagos játékidő rövid, csak 30 perc. A társast, 10 éves kortól ajánljuk kipróbálni. A játékmenet erősen épít a pakli tervezés és a kártya húzás mechanizmusokra. In Flocks & Flyways, the goal is to collect the most Migration Tokens by creating and migrating Flocks of Birds south for the winter to warmer feeding grounds. Players will need to strategically navigate crowded Flyways and catch Strong Tailwinds while avoiding dangerous Predators, Fog and other hazards. The player with the most Migration Tokens when there are no tokens remaining wins the game. Each player may draft either two Birds or one Action from the Feeding Grounds. If a player is able to play a complete Flock(s), it may be played in any vacant, valid Flyway for that Bird type. A player may play as many complete Flocks from her hand during her turn. 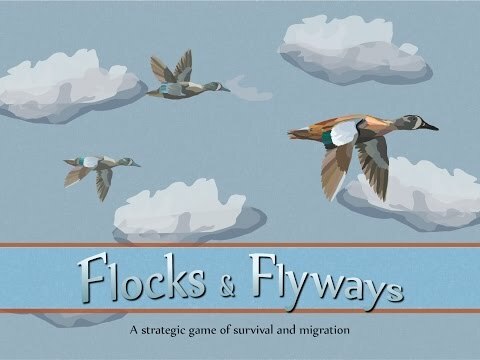 A player is not required to play a full Flock even if there is an open Flyway. For example, a player may want to hold onto a complete Flock to create an even larger Flock for more points. After drafting cards and playing any Flocks, that player refills the Feeding Grounds back up to six cards to signal her turn is complete. If the draw pile is empty, reshuffle the discard pile to form a new draw pile. 2) Play Actions: After each player has had the opportunity to draft and play Flocks, beginning with the person with the player one token, each player may play one Action from her hand. 3) Migrate: Starting with Pacific Flyway, moving in order towards the Eastern Flyway, place one Migration Token on each Flock currently in play, unless prohibited by an Action (i.e. Fog). If the number of tokens on the Flock is equal to the Migration Time printed on the card, the Flock owner collects all Migration Tokens currently on the Flock and the Flock is then discarded. Full Flock Bonus: The owner of the Flock receives +1 additional Migration Token from the pile for each additional Bird over the required Flock size. Safety in numbers! After the Migrate phase is complete, all players must discard down to the hand limit of ten cards. The player one token is then passed clockwise, shifting the starting player for the new turn. Refill the Feeding Grounds and continue play until all Migration Points are expended. When the last token is played on a Flock, the game ends immediately. Any Migration Tokens on Flocks in a Flyway go to the owner of those Flocks. Each player adds up their token and the player with the most points wins!